Princess Cruises was the first cruise line to take guests through the Panama Canal in 1967, one of the world’s most coveted engineering marvels. Fifty years later, the cruise line marks another major milestone with the very first mega-cruise ship, Caribbean Princess, to traverse the newly expanded “Neo-Panamax” Locks. Marking the 50th anniversary in 2017, Caribbean Princess is the first post-Panamax cruise ship to take more than 3,000 guests through the newly opened Agua Clara locks on the Atlantic side of the canal that opened in June 2016, as part of the 10-year, $5.4 billion “Neo-Panamax” expansion. Previously, only vessels with a maximum width of 106 feet could enter the locks. 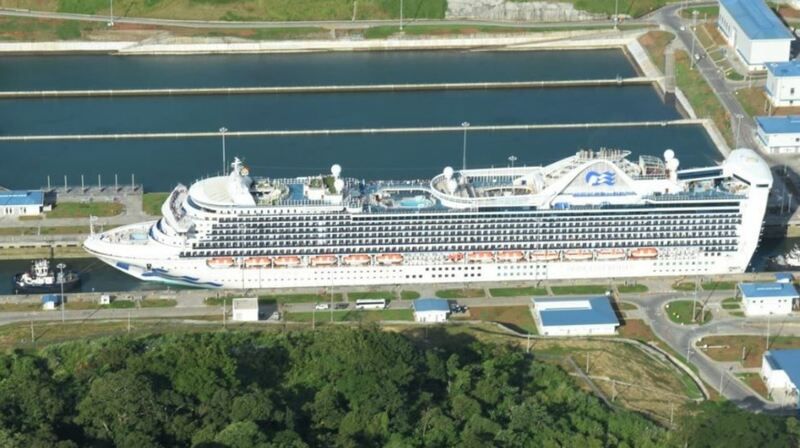 Caribbean Princess with a width of 118 feet, 112,894 tons and carrying 3,200 guests, sailed through the expanded locks for the first of 13 scheduled crossings on October 26, during the ship’s 2017-2018 Panama Canal schedule. Princess guests sail through the epic waterway that shaped the course of history by linking the world’s two mightiest oceans with an industrial feat that, even 100 years later, remains so breathtaking and monumental that it was named a “Cruise World Wonder” by Condé Nast Traveler. Onboard, expert narration enlightens guests as Princess ships pass through the locks and authentic Panamanian cuisine is served in the dining rooms. With port calls in Central America, South America and the Caribbean, ashore there is everything from Costa Rican rainforests to old world cities like Cartagena that recall the age of exploration. The only cruise line to offer a full season of voyages from fall through spring, Princess Cruises delivers the most itinerary options and sailing dates with three ways to experience the Panama Canal – roundtrip from the East Coast on 10-day sailings, roundtrip from the West Coast on 19-day sailings, or a full transit from ocean to ocean on 15-day sailings. Caribbean Princess recently underwent a multi-million-dollar renovation that included seven new food and beverage offerings, an updated youth & teen Center – Camp Discovery, more interconnecting staterooms, and updated décor. More information about Panama Canal cruise vacations aboard Caribbean Princess, Coral Princess and Island Princess can be found at princess.com/panamacanal.